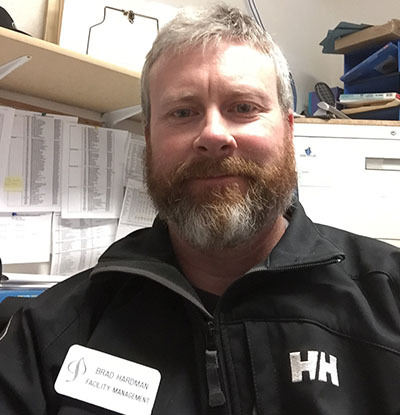 Brad Hardman is Aspen Skiing Company’s Facility Management Co-Director, where he oversees Aspen Skiing Company’s water systems and water use among other job responsibilities. He received a Bachelor of Science in Agriculture from the University of Arkansas before moving to Aspen to "be a snowboard bum." He has been with ASC for almost 22 years, spending time as a snowboard instructor and lift operator before moving into a management role. Brad now oversees all of the utilities, construction, and building maintenance for all four Aspen ski areas. You’ve been with Aspen Ski Company for two decades now, correct? I understand the water infrastructure at Aspen Snowmass was not great when you first started, what were the biggest problems and what did you do to tackle and fix them? I’ve been with the Aspen Skiing Company since January of 1995, so 22 years. I had various jobs with the company over the years: lift operator, snowboard instructor, and golf course maintenance at the Snowmass club. I started getting into water quality and became the Utilities Manager for the Ski Company in 2000, which was a year round job. Our biggest problems then were we couldn’t get water to many of the restaurants: Bonnie’s, Café West, Gwyns High Alpine, Sams Knob, and Café Suzanne (now Elk Camp Restaurant). We had to do partial replacements during the summer to get things up to speed. Now, most of these water lines have been replaced and water flows to all the restaurants. How big is Aspen Snowmass’s water infrastructure? What has been the biggest improvement in your 22 years there? How were you able to cut the Sundeck’s water usage by more than half? There are miles and miles of pipe lines just for the drinking water at the four mountains, including 16 different pump stations. The biggest improvements would be replacing the entire pipeline to Gwyns High Alpine, the entire pipeline to Sams Knob and the entire pipeline to the Ullrhof pump house, which were completed within the last few years. All other improvements have consisted of digging up and repairing or simply replacing sections of pipeline of 300 to 600 feet. As far as the Sundeck savings- I would have to say that the telemetry system has made the biggest difference. Putting in low flush toilets and waterless urinals was also a big help. You just mentioned a telemetry system, what is it and why is it so important? A telemetry system is a way to actually see what your water systems are doing on a computer screen. One can monitor just about anything, but of course the more you want to see the more expensive the system. With my system, I can monitor pumps, tank levels, valves, temperatures, if there is water on the floor of a building and historic graphs. So in other words, I can see if a pump is running or not, see how full a tank is, if a valve is closed or open, temperature alarms of the inside of pump stations when it’s below freezing, whether there is water on the floor of a building, which would indicate I have a broken pipe, and the historic displays tell me exactly what a tank is doing. Say a toilet was running in a building, the tank level would start dropping and then I’m able to react and repair the issue. All of which saves water and decreases energy costs. The new Elk Camp Restaurant is unique because all the water for the toilets is raw water and is gravity driven. Tell us more about that, how much water does it save ever year? The Elk camp restaurant uses about 400,000 gallons of potable drinking water a year. If the toilets were fed with potable water, instead of raw water, the number would be in the 1.5 million range, so it is a significant savings. In the past you have talked about “making water,” I don’t think many people have ever heard the phrase “making water,” what exactly do you mean? The term “making water” simply means processing the product. I have 3 surface water systems on Snowmass. We pull raw water directly from ponds and send it through our filter systems to remove particulate from the water to meet Colorado regulations. There are various filter methods: we have a slow sand filtration system, a direct filtration system, and a conventional filtration system. These are a lot smaller compared to the city of Aspen or the town of Snowmass, but they do the job. We are a public water system that has to follow the rules, just like any water entity in the state of Colorado. Is what you’ve done at Aspen replicable elsewhere both in the ski industry and in other industries? I would hope so, since you’re dealing with our planet’s most valuable natural resource.